Prosecco sales are through the roof nationwide, and for good reason: the gentle nature of the bubbles, the faintest whiff of sweetness, and … let’s be honest … a flavor profile that kicks any party into high gear. With Prosecco so popular, it’s high time to get our facts straight about the great bubbly of Northeast Italy. Here are some fine tidbits of info to bring to your next gathering! There are two VERY different styles of Prosecco: Frizzante and Spumante. Learn the difference! However, the Spumante style of Prosecco can, like Champagne, have up to four bars (or atmospheres) of pressure. In other words, more bubbles and more richness. 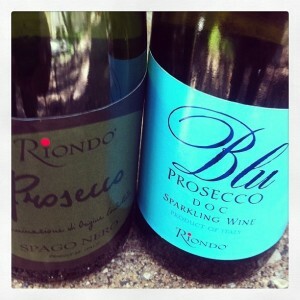 If you are normally a Champagne or California Sparkling wine drinker, seek out the Spumante styles (such as the Riondo Blu pictured on the right). Up until 2010, Prosecco was both a grape and a place. This was not a big deal when few people consumed Prosecco outside of the Veneto, but it became a huge problem as the popularity of the wine increased. Why? Because you could make a Prosecco without it being from Prosecco. The finer Prosecco producers (i.e. all the producers we carry) cried foul and justifiably so … how would Napa like it if people could use “Napa” on the label without it being from Napa Valley? The European Union stepped in and starting in 2010, the name of the Prosecco grapes turned into the very bland and forgettable name Glera (pronounced, as you may think, Ghe-ler-ahhhh … drop your shoulder, shut one eye, and wiggle on the last syllable for greater effect). So now, any wine labeled “Prosecco” has to come from the designated Prosecco zones of Italy and be produced with the Gleraaaaaaaaa grape. If you lived in Northeast Italy, you’d consume lots of Prosecco but rarely intellectualize it. So here is what happens if you visit a tiny little family owned enoteca in Northeastern Italy: you sit down, you say hello to the owners/family, you are greeted with warmth and love, and all of the sudden WHAMP! a carafe of Prosecco lands in front of you. You didn’t ask for it, but you will be charged for it. The purpose of the Prosecco is to clean the palate, help rid the taste of the three espressos you had in the afternoon, to clear the mind, and to help you ease into dinner. Terroir is a real thing when it comes to Prosecco. There are various DOC’s and DOCG’s when it comes to Prosecco, and it reflects the varied terrain in the land outside of Venice. 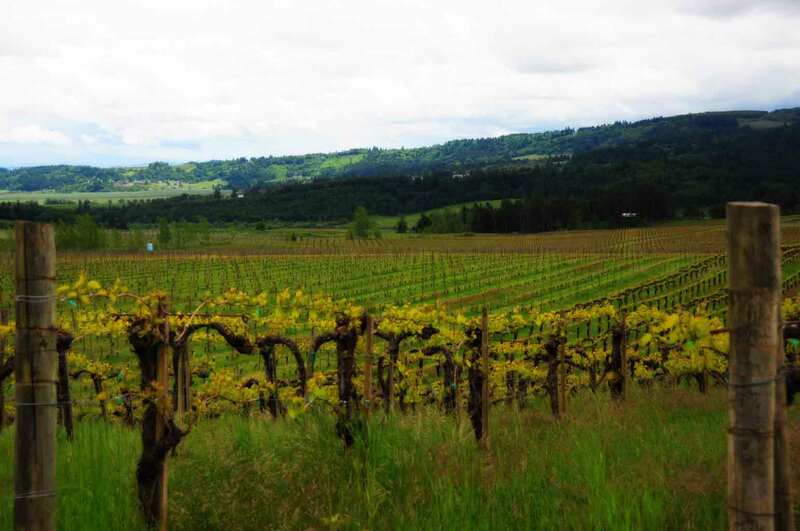 Much Glera is planted on the flatlands, and it’s not that those wines are lesser quality but they simply don’t have the dynamic personalities of the hillside grown Glera. Our Proseccos from Adami, Riondo, and Il Follo are all absolutely top notch from many of the top vineyard holdings of the region. So a challenge to all wine lovers out there: seek out Prosecco. Find examples from the different DOC’s and DOCG’s. Try the Frizzante style side by side with the Spumante style. Experience different levels of residual sugar (“Brut” vs. “Extra Dry”). A weekend of enjoyable Prosecco consumption (you can call it homework) will open your eyes to the many styles available.